After the consultation where we discuss the treatment with the patient, we apply our specially formulated topical numbing cream prior to treatment in order to minimize any patient discomfort. A lubricating topical gel is then applied to the skin to ensure the micro-needling pen can be easily maneuvered over the area being treated. These gels are enriched withanti-aging properties, such as Platelet Rich Plasma (PRP) to increase collagen production or hyaluronic acid serum. As the micro-needles perforate the skin, there will be minimal pin-prick bleeding. The treatment usually takes 20-25 minutes to be performed, but this can vary depending on area(s) treated. Following the procedure, you will note some redness, swelling, warmth, and a feeling of tightness for 24-48 hours. Is microneedling safe? What are the risks? 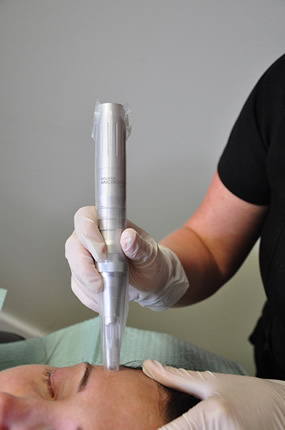 Yes, Microneedling is one of the safest cosmetic procedures because the needle punctures are controlled and very precise. You may experience temporary mild skin irritation after treatment if you have very sensitive skin. Other risks, although less common, include skin hyperpigmentation (darkening of the skin) or infection, which is very rare. 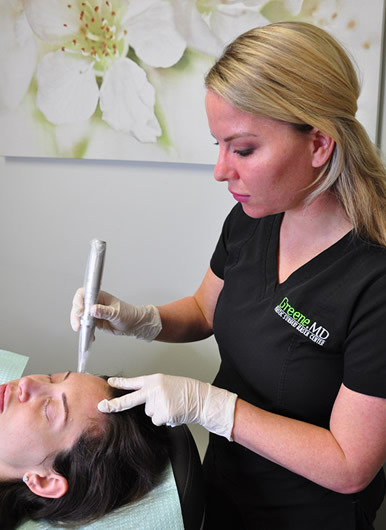 Your consultation prior to your Microneedling procedure, you will have a complimentary consultation will ensure that you are a good candidate for this treatment. You can expect mild redness of the skin in the area treated for 24-48 hours. We recommend patients avoid exercise at least 24 hours after treatment. Many patients will experience a healthy glow after just one treatment especially if they have also undergone the PRP procedure. However, if you are treating specific concerns, such as poor skin texture or scarring, we usually recommend a series of 3-6 treatments. We apply a topical numbing cream prior to treatment in order to minimize patient discomfort. Some describe the feeling of sandpaper being moved across the skin. Most patients tolerate this procedure well. Although many patients will see some positive changes within the first week, optimal results usually occur after 2 to 3 months. This allows for complete healing to occur with production of new collagen and elastin.